There has been a bit of a divide so far in what you can get from a smartwatch. The majority of the offerings are plastic and look like souped-up calculator watches. There are a couple options that have tried (or will try) to capture the aesthetics of a traditional mechanical watch; but, in the end, you're still dealing with a touchscreen alone. That's where Kairos comes in with a new hybrid idea. Fair warning: as of right now, these devices are nothing more than a concept render and a promise, which could very well end up being an interesting fake designed to get your pre-order money. 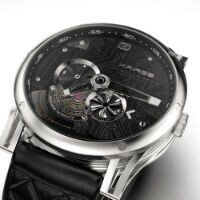 However, if Kairos does somehow come through on this lofty promise, you would be looking at a hybrid watch that works as a mechanical watch - powered by wind-up/motion - that has a smartwatch display on top to serve up notifications and alerts, or for use as a remote control. It is a very impressive idea, because it would mean the battery would only be used for notifications and not for displaying the time. Kairos claims this will give the smartwatch side of things 5 to 7 day battery life, which is far longer than any smartwatch with a full color display (but about the same as the Pebble). Interestingly, Kairos is also offering a deal where you can upgrade the device including display, battery, etc starting at $99. Kairos is supposedly planning four models which range in pre-order price from $499 to $1199. The price differences boil down to two basic choices - material (metal or gold), and mechanical watch components (Japanese or Swiss). All of the models are said to feature TOLED displays (the 't' stands for transparent), magnetic chargers, and choice of leather or PVC band. The watches with the Japanese guts are planned for a December release, but you'll have to wait until March for the Swiss models. The Swiss models will be limited production runs though. This is all assuming that Kairos can actually come through on the plans. If you pre-order and the watches never ship, you might not get your money back. The website only mentions refunds in the event of a defect in the hardware, so buyer beware. Still, if Kairos can come through on this, it could be a pretty amazing entry in the smartwatch field. The Kairos watches are said to support Android and iOS, but it is unclear what kind of software runs on the watch itself. Now that's what I call a smart watch. Apple, take note! You can pre-order one at their site . The cheapest ( which is the MSW 115 METAL - $499.00 ) one arrives first December 2014. I'm going to y pre-ordered mine. I said no to the Moto 360. "(. I just like the fact that the smart part gets out of the way when you don't need it. Even if the battery runs out, it still functions as a normal watch. If this tech is true and they can pull it off, this will be what I want in a smart watch. I don't know much about the screen tech, but it looks low powered. I like the fact that the watch is a typical watch and then the screen comes on only when you need it. I love watches and this is the best of both worlds. Fully agree with that. This thing is beautiful, I hope they pull it off and the price is in my range, I'd love to have the silver version. Make it a Eco drive system and I may bite. Indeed a very ambitious promise from a company that I've never heard before. But if they can deliver and keep the slim profile then current smartwatch makers should go back to the drawing board. I would, without a shadow of doubt, buy one of these!! What a great idea! As a fan of both worlds I am impressed. Just need a metal bracelet option. This is what i call a proper smart watch! Cool concept, but that is one very ugly watch. I'll take the 360 over this any day.